Disney has been having a banner year. And they are set to break the Market Share record when it comes to the 2016 box office. A lot of studios have had to face some pretty serious disappointments when to comes to raking in cash these past couple of months. Paramount is facing massive losses, and Fox had a couple of serious bombs like Independence Day: Resurgence and Ice Age: Collision Course. But Disney, on the other hand, is absolutely dominating with unprecedented success, and things are only going to get better. According to The Wrap, Disney has a 26.9 percent market share at the domestic box office for 2016 so far. With massive hits like Captain America: Civil War, Zootopia, Finding Dory and The Jungle Book all raking in big money, the couple of under-performing movies the studio has had, like The BFG and Alice Through the Looking Glass, simply don't matter. Warner Bros., who have also had some big hits this year, is Disney's closest competition, but they are far behind with a 16.4 percent market share. As of right now, Disney's total domestic haul is $2.1 billion, and they very well may be able to cross $3 billion by the end of the year. Earlier this year, Disney became the fastest studio to ever cross $1 billion at the domestic box office, reaching the milestone on May 7. They were aided heavily by Star Wars: The Force Awakens bringing in a large chunk of its massive domestic take after the new year. Universal previously held that record, and Disney was able to beat it by 37 days. As impressive as all of that sounds, that is only the domestic side of things, and Disney has absolutely crushed it internationally as well. Looking at the worldwide picture, Disney has the top four highest grossing movies of the year, with Captain America: Civil War taking the top spot at $1.15 billion. 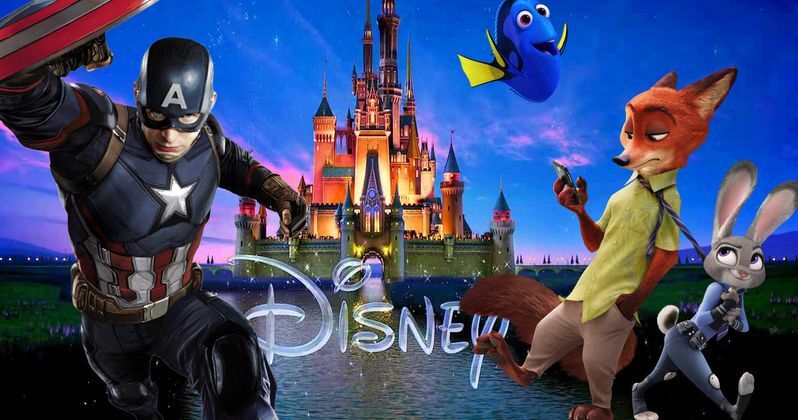 The Marvel Studios sequel is followed closely by the original animated feature Zootopia, the live-action adaptation of The Jungle Book, and Pixar's Finding Dory. The two top-grossing non-Disney movies of the year are Batman V Superman: Dawn of Justice for Warner Bros. at $872 million, and Deadpool for Fox with $782 million. Though Batman V Superman made more money, Deadpool was a bigger success, as the production budget for Deadpool was around $50 million, and the budget for Batman V Superman was reported to be $250 million. Disney has absolutely mastered the art of mass appeal, and things are showing absolutely no signs of slowing down. Still coming this year is the Marvel Studios movie Doctor Strange, which will do very well, even if it is on the lower end of the Marvel Cinematic Universe movies. The also have the animated feature Moana coming out, which features the voice of Dwayne The Rock Johnson, so that will likely crush it. Not only that but to round the year out, Rogue One: A Star Wars Story will come out to bring in some big time money for the last couple weeks of 2016. Odds are, Disney will be able to repeat this success next year, with another massive slate that includes three Marvel movies, Star Wars Episode VIII, Cars 3, and Pirates of the Caribbean: Dead Men Tell No Tales. In short, Disney's dominance is sure to continue for the foreseeable future. Avengers 4 to Revisit Civil War Opening Scene?